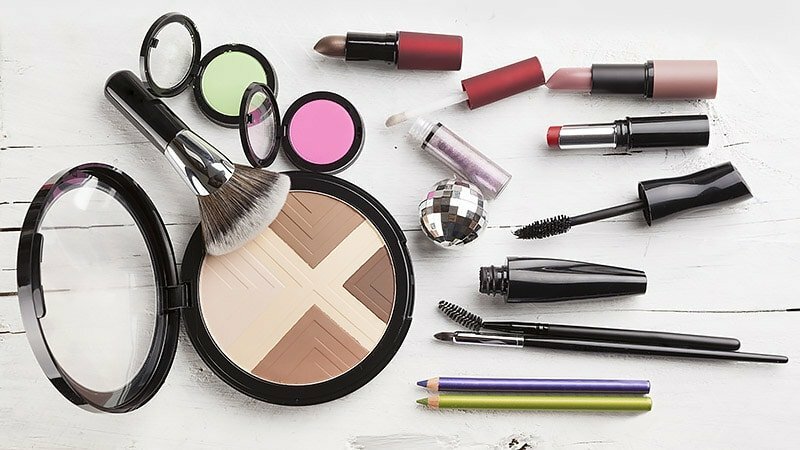 Whether you own just a handful or close to a ton, makeup products have the power to suddenly turn your designated styling time chaotic as you search the corners of your house for that one particular mascara. If this situation sounds familiar and you’re tired of continually losing your beauty favourites, it might be time to get organised and take back control of your makeup cabinet. We’ve rounded up the best makeup organizers to help you declutter your life and lift your beauty routine to the new heights. 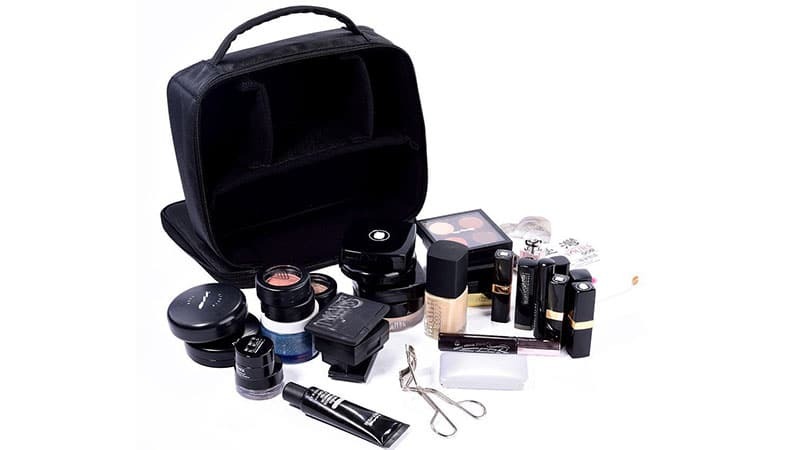 If you’re looking for something compact yet spacious for when you’re on-the-go, this Samtour Travel Makeup Case might be the solution for you. Adjustable padded dividers are completely customisable so you can arrange the compartments to match the sizes of your products. The top features separate pockets to hold several makeup brushes in place at once. 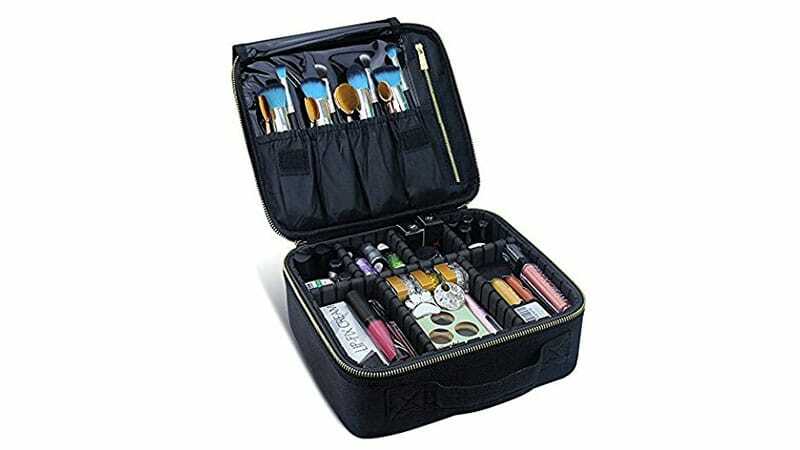 The MelodySusie Makeup Organizer features 24 large chambers that will store your everyday beauty essentials and more. 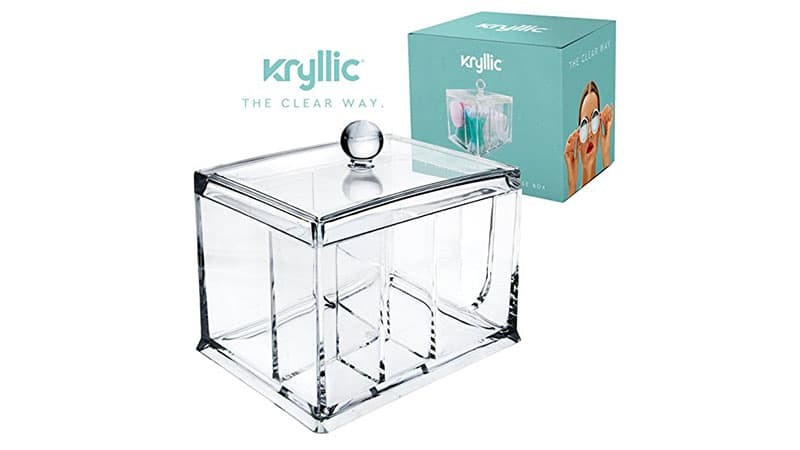 Just like the Kryllic model, it’s made from thick, transparent acrylic material, which allows it to blend seamlessly into your bathroom cabinet or beauty counter. The three different modular compartments will enable you to customise its shape according to your storage needs. 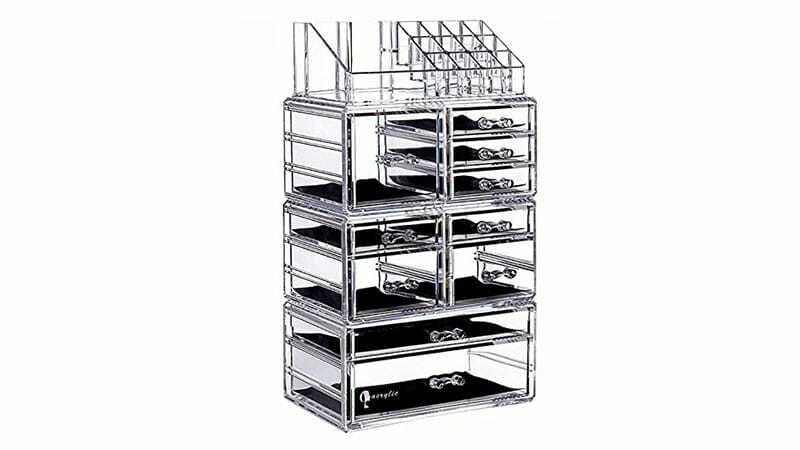 If makeup is more than just a hobby for you, you might want to consider equipping yourself with something more robust, like the Songmics Professional Cosmetic Organizer. Four inner storage trays and an additional deep storage compartment on the bottom provide sufficient space for all your styling equipment while its floral aluminium finish provides a durable yet chic exterior. 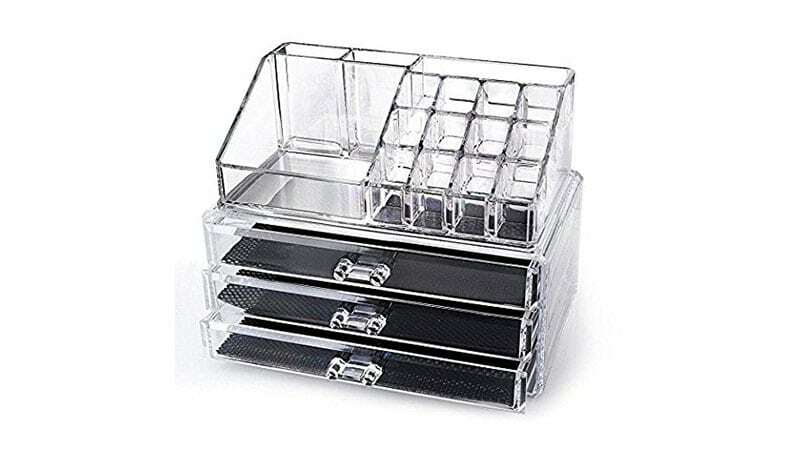 The Cq Acrylic Makeup Storage Cube consists of four different compartments that can be used as a whole or individually. 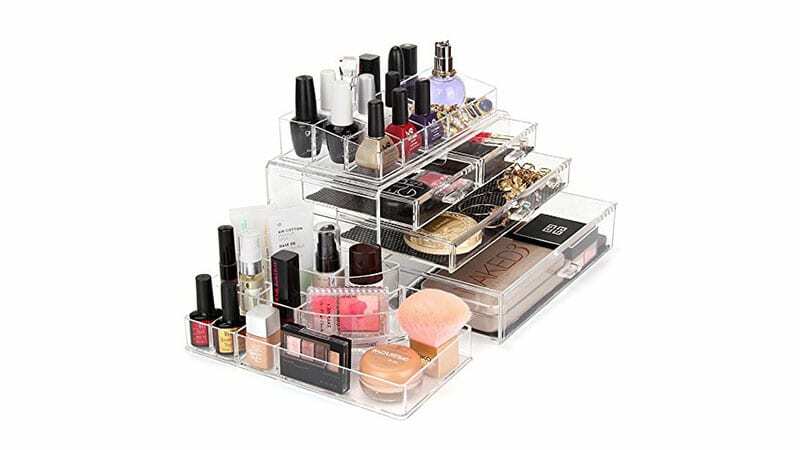 Thus, it offers a tremendous amount of storage space for your makeup favourites and even the essentials you may not use quite as much. 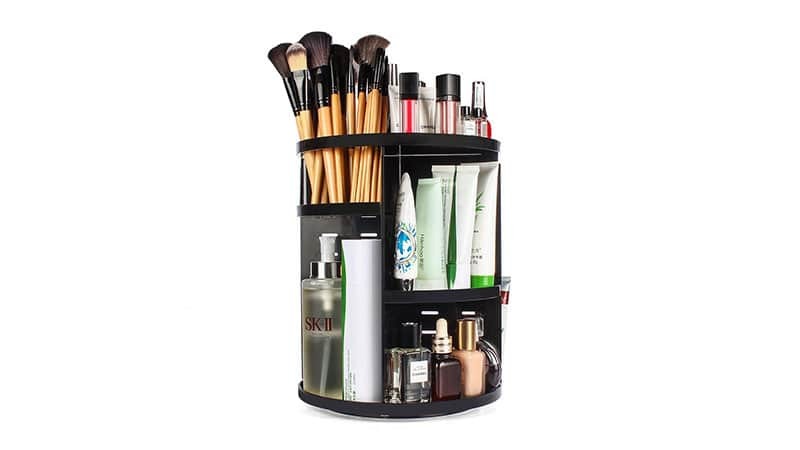 The Eloki Makeup Organizer is a rotating storage dream for makeup addicts. 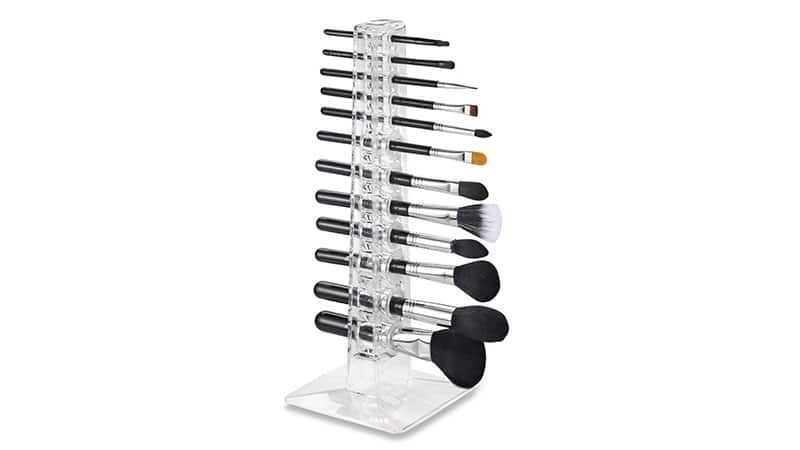 Its smart and compact design won’t take up much space in your home and yet, it easily holds up to 30 makeup brushes, 20 beauty products and other makeup related knick-knacks. The 360-degree design places every single product right at your fingertips. 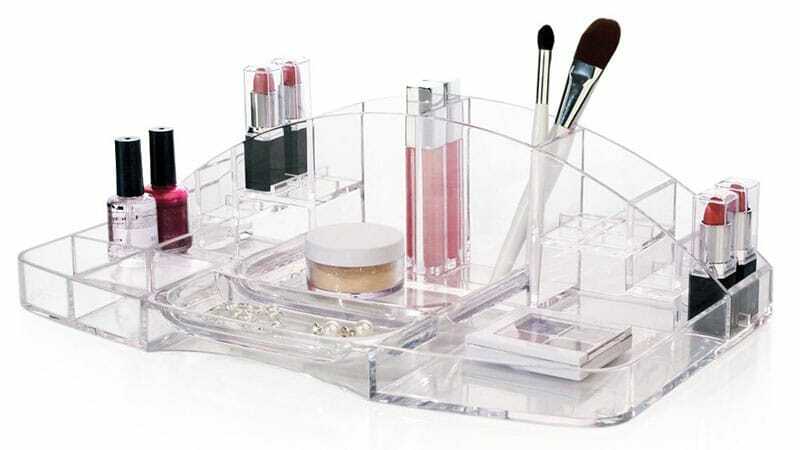 The Kryllic Clear Makeup Organizer combines vintage-inspired design with modern functionality. At once glance, its transparent exterior reveals everything on the inside, so you’ll never have to dig through the depths of your makeup bag again. The sleek and elegant look of this case turns re-arranging your beauty products into a decorative endeavour. If you’re after something with a little more street style flair, the MVPower Professional Makeup Case should be on your list. This organiser will disguise your products as a fashionable bowler bag in either hot pink or black with red accents. The inside reveals a generous space with seven compartments across three levels. The Alegory Makeup Brush Organizer is a chic and space-saving option to store your brush collection at home. It’s made from a single mould of acrylic, providing storage for up to 12 makeup brushes of different sizes. A discreet silicon plug in each hole prevents your tools from sliding out when not in use. 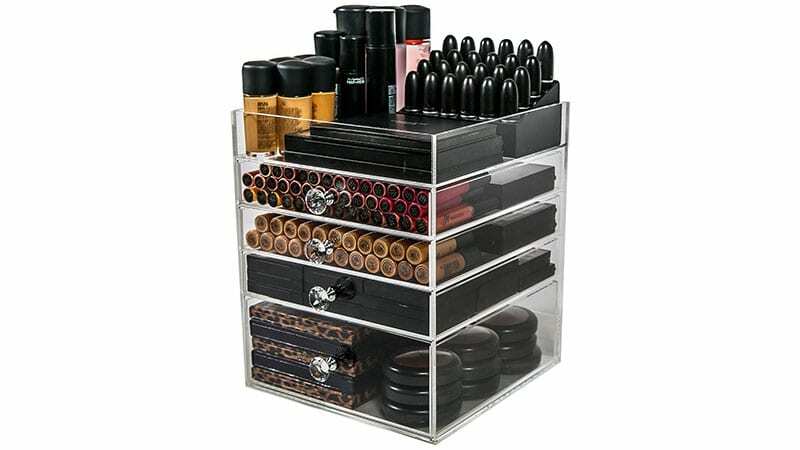 The Stori Makeup Organizer will display your products as if it was a professional beauty counter. 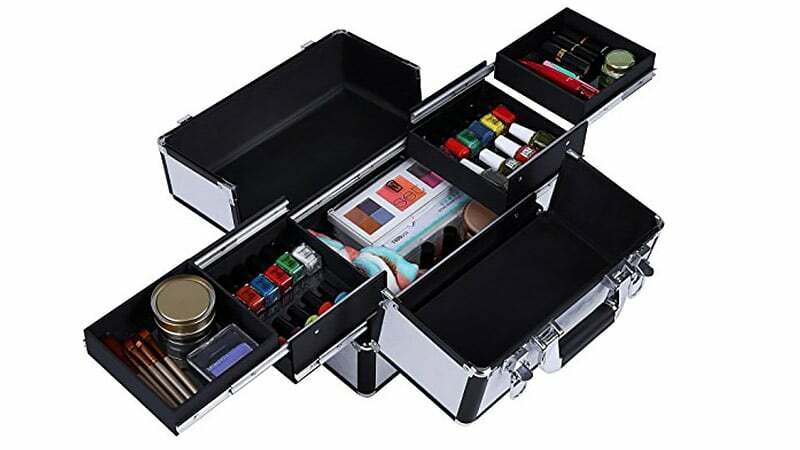 15 cleverly positioned compartments hold everything from lipstick to nail polish, powder, brushes and hair accessories. With the Stori in your home, you’ll long to show off your makeup collection. If you own a larger-than-average makeup ensemble, the N2 Makeup Co. Organizer Cube will have you covered. With five spacious compartments, you can fit everything from your gloss collection to foundations, primers, and contouring kits. The discreet, clear-crystal design will blend seamlessly with the interior of your home without drawing too much attention to it. The Lenubo, Glenor Beauty Train Case is a generous organizer for all aspiring and established beauty professionals. On three levels, the adjustable compartments will fit products of all shapes and sizes, while keeping them secure and intact during transport. This portable train case is available in sophisticated black, gunmetal silver and a soft pink. The water-resistant fabric and padded interior of the Flymei Makeup Case make it a reliable accomplice when you’re out and about. It provides decent space for your everyday beauty products and is made from a sturdy oxford fabric that is easy to clean. You can also use it as a camera bag or storage for other small items and accessories. 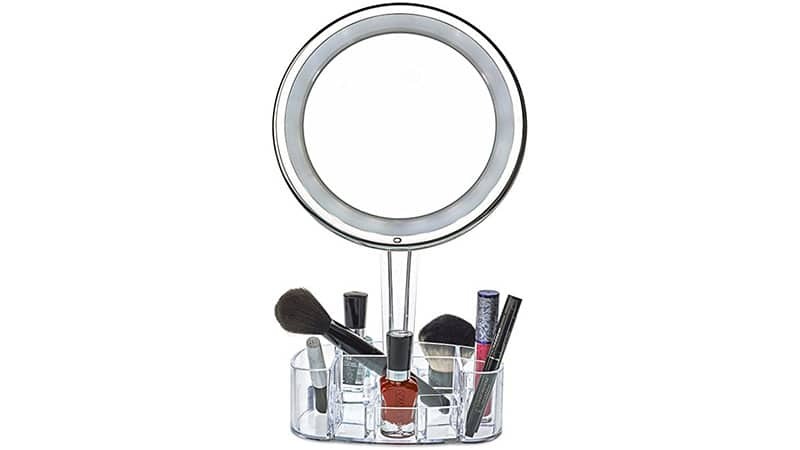 This stylish acrylic organizer offers a generous amount of space for your large and small beauty items. While the bottom three drawers conveniently store eyeshadow and contouring palettes away, the more modest upper compartments present the ideal stand-up space for gloss, lipsticks, brushes and mascaras. Let’s bring out the big guns. 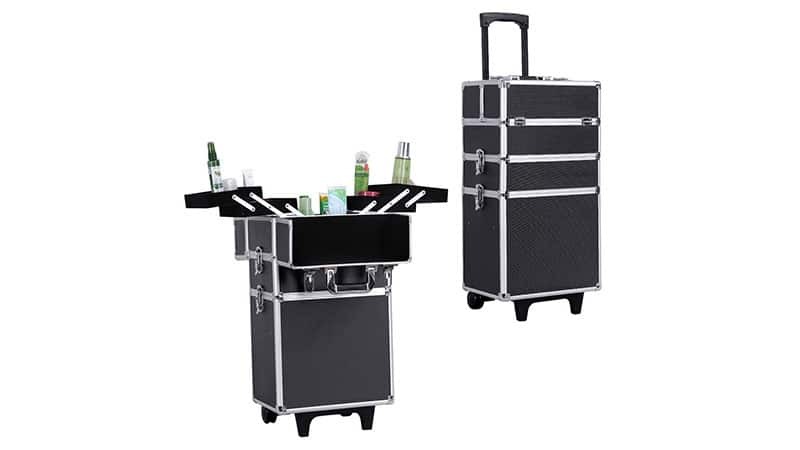 The Songmics 4-in-1 Rolling Makeup Train features four trays, one organizer and another ample storage space to stash all of your styling products in a secure manner. Crafted from light aluminium with steel corners and a shock-absorbent surface, the Songmics Train will keep your pressed powders perfectly intact. The Daisi Makeup Mirror is a nifty little tool that will serve your beauty needs on three different levels. The adjustable swivel stand will hold all your daily makeup essentials, while the magnifying mirror will help you apply a flawless face. The LED ring light also comes in handy while getting ready for a night out. 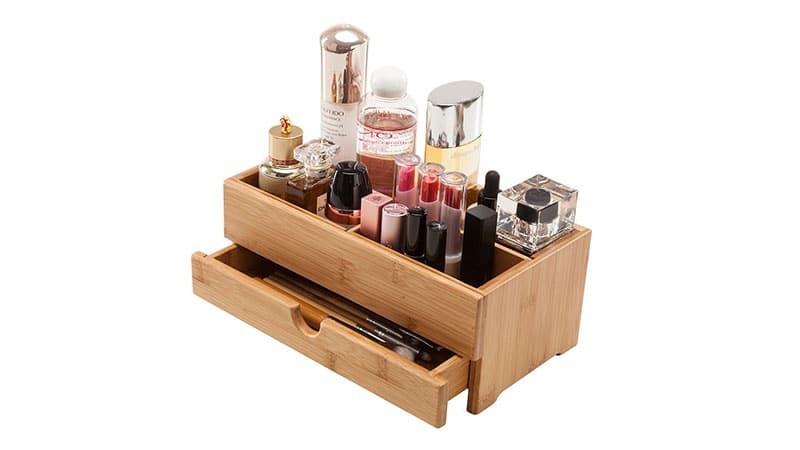 For a more rustic yet elegant look, consider this GoBam Bamboo Desktop Organizer. Made from natural premium bamboo, this chic, wooden box is sure to stand the test of time. Equipped with two large, adjustable compartments, it will store all your beauty favourites to save you space at home. The compact and efficient design of the Jerrybox Makeup Organizer makes it a great addition to small bathrooms. 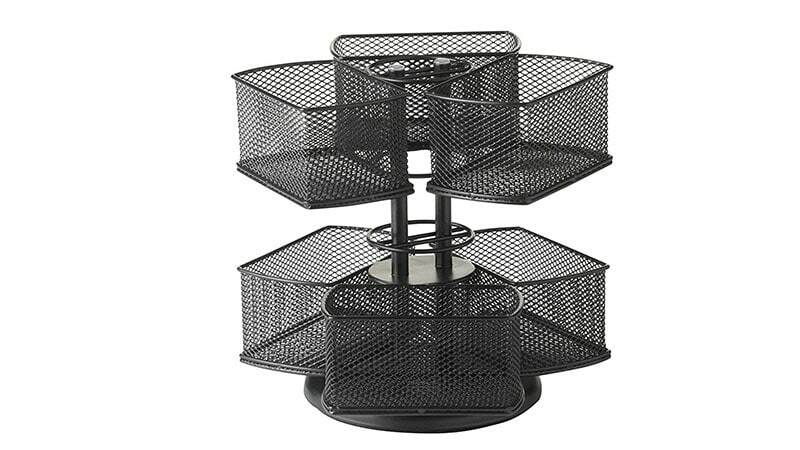 The 360-degree rotatable stand features multiple trays that will hold an array of items to save you tons of cupboard space. 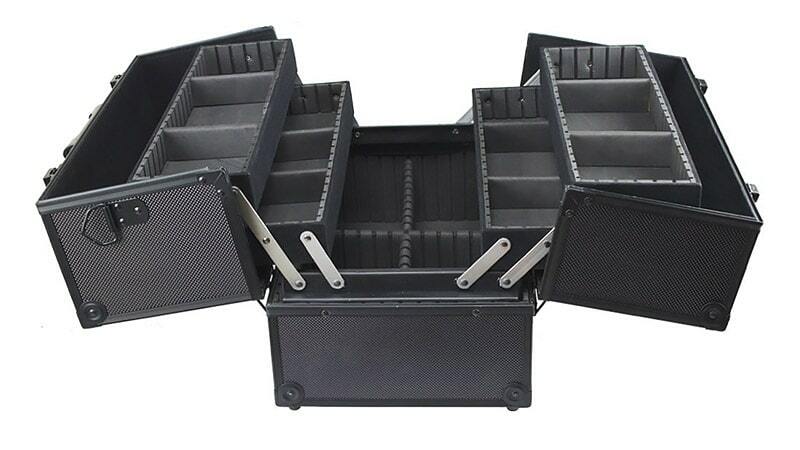 This low-key Wodison Foldable Cosmetic Organizer is all about practicality and convenience. 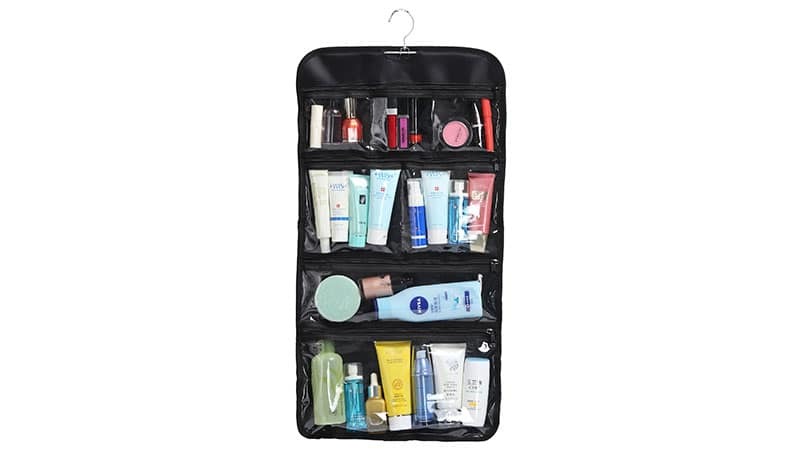 Featuring a hanger on top, three pockets in the first row, two in the second, and a larger one below, it will fit all your makeup needs while taking up minimal space in your luggage. 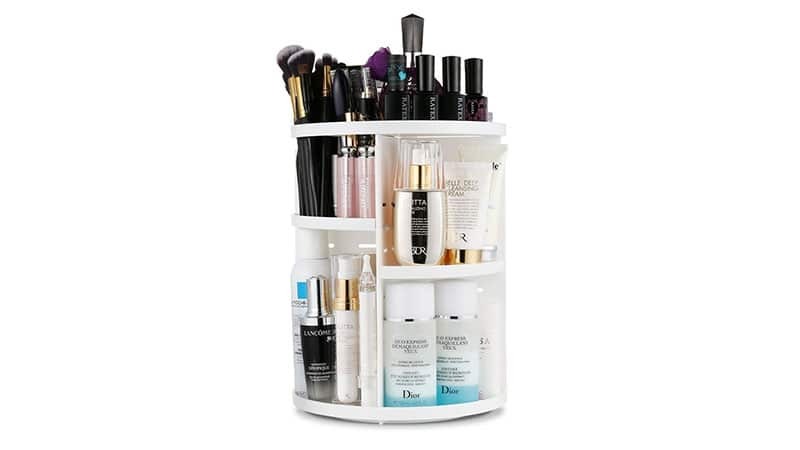 The Nifty Cosmetic Organizing Carousel offers maximum storage in minimal space. 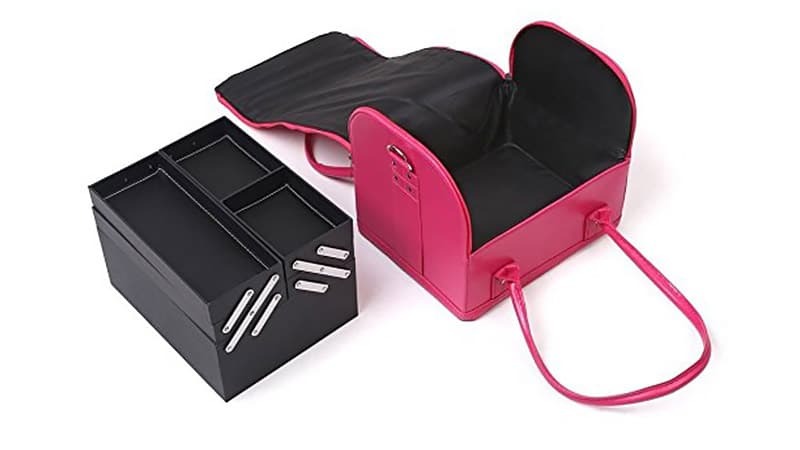 Available in silver, black, pink and purple, this makeup organizer keeps all your essentials accessible while maintaining a polished appearance. The cute design is not the only thing that’s appealing about the Mr.Pro Makeup Tavel Bag. Its lightweight, foldable design makes it a perfect adventure companion while the water-resistant and fast drying fabric prevents bacterial growth caused by residual moisture. In addition to multiple, spacious compartments, this travel-friendly organizer also features a sturdy hanging hook to make your products more accessible when in use.